About the book, Are My Kids On Track? 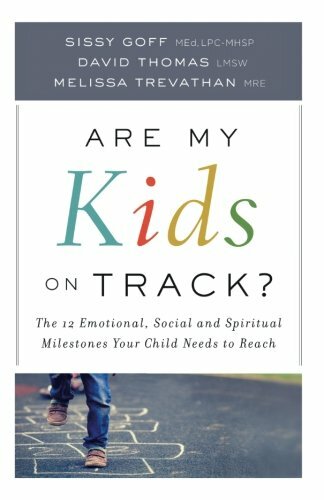 Are My Kids On Track focuses on twelve milestones that all children should reach socially, emotionally, and spiritually. The book is divided in three sections, and it doesn't have to be read in order although I am reading it order. The emotional milestone section is where we need the most focus currently. I believe you could easily read the section pertaining mostly with the area you want to focus on with your child. Within each section there are four areas of focus. In the emotional milestones section, the authors focus on emotional vocabulary, perspective, empathy, and resourcefulness. The book is authored by three counselors in first person. You will know who is speaking because their names are in parentheses next to the pronoun, I. David primarily speaks when it relates to boys. How I am using Are My Kids On Track? Are My Kids on Track? begins each section with an opening story and background about the topic. After the author shares the base for the chapter then the rest of the section is divided between boys' needs and girls' needs. Since I do not have sons, I only read the sections about girls. I appreciate this because it hones in on the specific needs for each gender, and I don't have to spend as much time deciphering what applies mostly to girls. Each of the gender specific sections focuses on the gender and its emotions, stumbling blocks, and building blocks. The authors also share tidbits from their interaction with children in their counseling programs as examples. Since I have been most focused on the emotional section because my girls struggle with their emotion about certain things, I have found it extremely helpful. One tool, in particular, that caught my eye was creating or purchasing an emotional chart. This was eye-opening for me because my daughters will often say they do not know why or how they're feeling. This can be a bit frustrating. The emotional chart is a visual tool that helps them to put words to the feelings they once struggled to express. At the end of each chapter, there are practical tools that can help you to bridge the gap with your kids whether it's emotionally, spiritually or socially. What I learned from Are My Kids On Track? OTJT parenting can be tough at times because you simply can't know everything. When my oldest daughter was around 4, I realized that I had to teach her about empathy. During this time, I worried about her because I thought empathy was an innate trait. I worried that she wouldn't be able to show empathy. After reading the chapter on empathy, I learned that my taking the time to teach her was exactly what I was supposed to do. It is a trait that has to be taught, and we aren't necessarily born with it. We're several years down the road from those early experiences with empathy, but I struggled with the idea of something being "wrong" with her emotionally. Are My Kids On Track? is helping me to recognize that things I think people should automatically know aren't usually the things that people automatically know. Final thoughts about Are My Kids On Track? Like I stated earlier, I do not read many parenting books, but I really appreciate Are My Kids On Track? because it offers practical tips that I can incorporate in my real life with my real children. I also like that I am encouraged to make it fit my children rather than using cookie cutter tools. The authors do not make you feel like the solutions are one-sized fits all. Are My Kids On Track? is a good parenting reference book. I received this book for review from the publisher, Bethany House. I was not required to write a positive review. All thoughts are my own.